I have a 96" wall. The wall and ceiling are not square. I wanted molding on the top. I leveled and secured the molding. 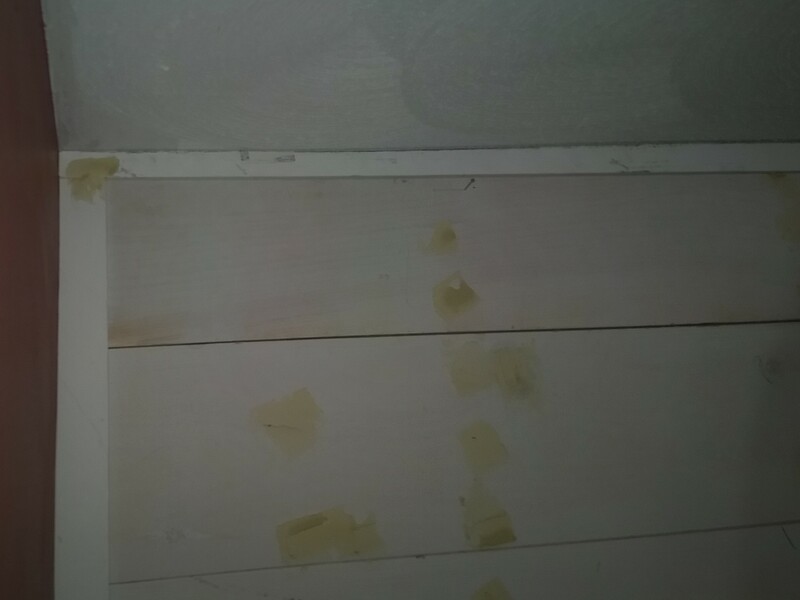 The left side of the molding was up against the ceiling. The right side of the molding was about a 1/4" lower than the ceiling. I scribe the molding with a pencil and a washer and run it the length of the wall. However, the left side is now narrow and the right side is thicker. This is not what I intended. You can notice it. But the bottom of the molding is level. In a perfect world, if everything in a house was level and flat, scribe molds would not be needed or at least easy to install. The need to scribe a molding in depends on a few things. 1.The size of the molding to be scribed. If a molding is already narrow on the face and is trimmed down the difference will be immediately detectable. In my opinion, it is all about proportions. A 3" wide molding can handle a taper of a 1/4" off one edge much better than a 1" molding. That amount off a 3" molding over a 5' run is much less noticeable than the same amount of taper on a 1" molding. Length of run makes a difference too. Picture in your mind the same amount of taper on a much shorter piece. The conditions the wall the molding is going on, in your case the material appears to be ship lap, if that material is not run level and the last board is tapered wider on the left end and narrow on the right, which is what it appears the situation you have, tapering the molding so it is level will exacerbate the difference in the last panel, plus on top of that, the taper the scribe molding has. Sometimes while trimming a house, you cannot rely on level, level can be a reference point, but not a line to follow, especially in an old house where things have shifted or settled. In this condition you have, I would not trim the scribe mold at all, set it to the ceiling to follow it, that will reduce the amount of difference in the last panel. At the most, I would scribe the slight bow in the ceiling, to aid in making the bottom edge a bit straighter, but not much more than that. While I am installing a wall such as yours, I take measurements in 3 places, in the width and the height. The width measures tell me how easily the ends will be to cut, whether I have to change the angles as I go up the wall or live with a big caulk joint. The measure of the height, tells me if I need to adjust one or more pieces to get a good finish, or at least make sure the stuff that ends up at eye level is looking good. If the floor and ceiling is running out of level the same amount, I would tend to follow the floor so the rip at the ceiling is the same width all the way through. This has exceptions of course, but it would be my first consideration. Always check your progress at halfway points, halfway up the wall, go up again halfway to 3/4 height over all, and check dimensions again adjusting as needed. In your case, if the top panel is tapered to meet the ceiling, I would consider puling it down and tapering it no more than a 1/4" over all to reduce the difference at the ceiling. If the difference is a lot, you may want to taper more than one. The scribe molding to me is already small enough to not handle a trimming to a taper, but it could handle a slight dip to go around a hump in the ceiling. Not the answer you're looking for? Browse other questions tagged walls ceiling trim or ask your own question. How to install crown molding or valance board around a cabinet?